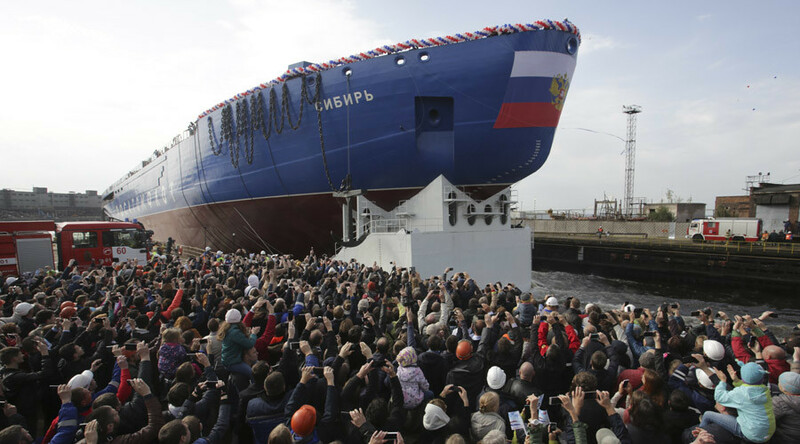 The first serially-produced Sibir nuclear-powered icebreaker, designed to reinforce Russia’s leadership in the Arctic, was commissioned on Friday at the Baltic Shipyard in St. Petersburg. It is one of the three vessels part of Project 22220 which are to become the world’s largest and most powerful nuclear icebreakers. The lead ship of the project, the Arktika, was commissioned last year. Designed for transporting cargo via the Northern Sea Route, the Sibir was ordered in May 2015 and is due to be delivered in 2020. The third icebreaker, the Ural, is planned to be delivered in 2021. Sibir has a displacement of 33,500 tons and is 173.3 meters long with a beam of 34 meters, and has a crew of 75. The double-draft design allows for operations in both deep Arctic waters and estuaries of polar rivers. The vessel is powered by two nuclear reactors with an output of 175 MW. The nuclear-powered Sibir will be capable of breaking ice fields up to three meters thick, making way for LNG carriers delivering Russian gas to Asian customers. It will also carry out rescue work in ice conditions and ice-free waters. “Sibir has its predecessor - the icebreaker [50 Let Pobedy – Ed.] which was commissioned in 1977 and has already seen long service. Its absolute record was set in May when it reached the North Pole. I wish today’s Sibir to also break the record," said Rosatom’s Director General Alexei Likhachev. 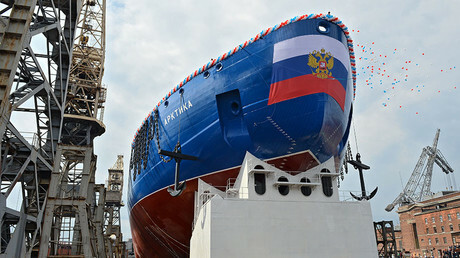 All three ships will be commissioned by Rosatomflot, a subsidiary of Russia’s state atomic energy corporation Rosatom. The craft will have a working capacity of 110 MW and will be capable of cutting through ice up to 4.5 meters deep. According to Russian President Vladimir Putin, the Leader will be by delivered by 2025.